Out of the blackest Oklahoma night, some intrepid cosmic explorers spot the brightest sights in the universe. Pauline Austin also sells her fresh Indian tacos from the drive-through for those on the go. At Camp Billie Joe, lights out really means lights out. As the sun sinks beneath the horizon and the mating call of crickets fills the air, no one lights a campfire or turns on a lantern. In fact, all outside lights are extinguished—only the soft glow of infrared flashlights is allowed. That’s because this small camp just outside Kenton—so far out in the Panhandle that visitors almost are in New Mexico—is home to the annual Okie-Tex Star Party. This year is the thirty-fifth anniversary of the event, though it’s only been in Kenton since 1999. It originally occurred in Ardmore, but light pollution began inhibiting nighttime visibility, according to Oklahoma City Astronomy Club member Mike Brake. That’s not much concern in Kenton, where the 2010 U.S. Census pegged the population at seventeen. But that doesn’t mean there aren’t plenty of lights. The Okie-Tex Star Party draws about five hundred amateur and semiprofessional astronomers from around the world to see one of the most spectacular light shows on the planet. From horizon to horizon, the stars blanket the night sky in a way that’s impressive even to those without a telescope. While there are a few stargazers staring in awe with the naked eye or binoculars, most of the visitors to Camp Billie Joe—named by the Labrier family, who donated the land—come with telescope equipment that ranges in value from a few hundred dollars to tens of thousands. “It can be an expensive hobby,” says Keith Bookbinder. A stargazing rig starts at a few hundred dollars, but as the obsession grows, so does the price tag. Albuquerque Astronomical Society member David Frizzell’s massive rig was about $15,000 plus extras. But many clubs will lend equipment, so cost doesn’t have to be a barrier to entry. During the event, stargazers spend days hiking or listening to lectures, including one by an astronomer from the Vatican, and nights under a tapestry of starlight. Frizzell has been to four Okie-Tex Star Parties, and he keeps coming back for the inky black skies and the camaraderie. At last year’s party, Frizzell had his eight-foot-long reflective telescope aimed at some classical astronomical sights: Messier objects, named for French astronomer Charles Messier, who first described them, and Barnard objects, which are dark nebulae first described by American astronomer Edward Emerson Barnard in 1919. Those like-minded folks come from states like California, Alabama, Pennsylvania, and Ohio. In 2017, a man and his son flew in from Australia to spend a week spying on celestial objects. Wally Knesel, Bookbinder, and Chris Duncan made the trek from Cincinnati to view the Horsehead Nebula, among other things. Brake says he was ten when Sputnik launched, and the lure of space never released its hold on him. Even decades later, his gaze keeps returning to the sky and the wonder that draws so many people back to Camp Billie Joe each year. 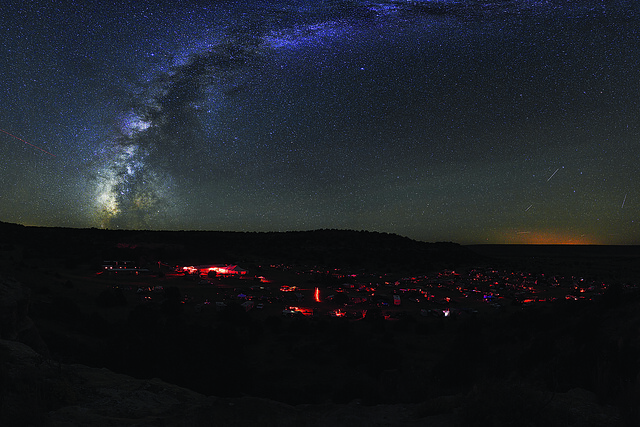 This year’s Okie-Tex Star Party is October 6-14. Registration is $60-$120. okie-tex.com.